Hybrid Inverter Charger There are 8 products. The range of hybrid inverter chargers in tienda-solar provides options for all possible facilities. The powers range from 800W to the smallest model, up to 16 kW single phase or 24 kW three phase, with the possibility of parallel connection of multiple units. They are ideal for a complete solar kit, either off-grid or self-consumption systems. The hybrid inverter chargers incorporate an input to connect directly strings of solarpanels or photovoltaic modules, making the regulation thereof as an independent solar charger. They can connect to battery systems 12V, 24V or 48V, depending on the model, to provide pure sine wave output 230V, suitable for any conventional electrical device, even the most sensitive. They also have a input that we can connect an auxiliary generator or the electrical grid itself, allowing charging batteries when needed, in emergencies or when consumption has exceeded planned, causing excessive battery discharge. For all these features hybrid inverter chargers provide all electronic needs of a solar kit in one device, thus lowering the total cost of installation. It is thus possible to configure a solar kit with three basic elements; one solar kit, a hybrid inverter charger and a set of battery storage, simplifying the system. Inverter Charger 12V 800W Huber Power 812 The Power Charger is a multi function pure sinewave team that combines the functions of inverter, charger and charge controller in one unit, which offers support UPS in a portable size. Inverter Charger 24V 1600W Huber Power 1624 The Power Charger is a multi function pure sinewave team that combines the functions of inverter, charger and charge controller in one unit, which offers support UPS in a portable size. Inverter Charger 12V 1200W Huber Power 1212 The Power Inverter Charger is a multifunction pure sinewave team that combines the functions of inverter, charger and charge controller in one unit, which offers support UPS in a portable size. Inverter Charger 24V 1600W Huber Power 1624 Plus The Power Plus inverter charger is a multifunction pure sinewave team that combines the functions of inverter, charger and charge controller in one unit, which offers support UPS in a portable size. Power Plus equipment is similar to Power equipment but with a larger MPPT charge controller. Inverter Charger 24V 2400W Huber Power 2424 Plus The Power Plus inverter charger is a multifunction pure sinewave team that combines the functions of inverter, charger and charge controller in one unit, which offers support UPS in a portable size. 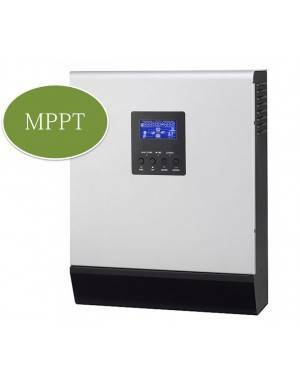 Power Plus equipment is similar to Power equipment but with a larger MPPT charge controller. Inverter Charger 48V 3200W Huber Power 3248 The Power Charger is a multi function pure sinewave team that combines the functions of inverter, charger and charge controller in one unit, which offers support UPS in a portable size. Inverter Charger 48V 4000W Huber Power 4048 The Power Charger is a multi function pure sinewave team that combines the functions of inverter, charger and charge controller in one unit, which offers support UPS in a portable size.